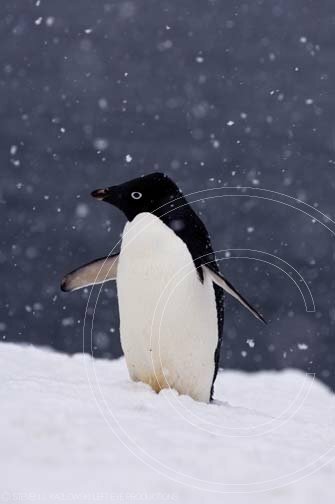 adelie penguin, Pygoscelis Adeliae, in falling snow along the western Antarctic Peninsula, Antarctica, Southern Ocean adelie penguin, penguin, aves, seabird, bird, animal, wildlife, fauna, aquatic, polar, flightless, carnivore, antarctic peninsula, antarctica, southern ocean, glacial ice, ice, snow, snowing, profile, vertical, gallerythree, © Copyright Steven J Kazlowski & Left Eye Productions. Images included in this database are protected under national and international copyright laws. Images may be used for comping purposes only and remain the property of Steven J Kazlowski and Left Eye Productions until authorised for use by purchase. Terms and conditions may apply.